I said before that Shangri-la Mactan Island Resort is Cebu’s premier resort. 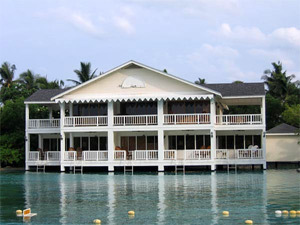 Well, Plantation Bay Resort and Spa, is a close second in terms of prestige. This seaside resort is located about six kilometers down the coast from Shangri-la and is one of Lapu-Lapu City’s numerous beach resorts. Its architecture is inspired by the colonial plantation houses in the U.S., hence the name. Unlike most other resorts, Plantation Bay has its own secluded beaches (no waves though) as is evident from the satellite pictures. Opened in late 1996, the resort covers 11.4 hectares and it’s centerpiece attraction is a saltwater lagoon with white sand beaches surrounding a freshwater swimming pool. If you want a real beach, the resort has access to the Galapagos Beach where you can engage in scuba diving. (They also conduct underwater weddings!) And being a spa, you can enjoy a wide array of body treatments like body scrubs, full body massages, and aromatherapy packages. Moreover, Plantation Bay boasts of no less than four restaurants: Palermo (Italian), Kilimanjaro Kafé, (international), Fiji (seafood and Asian), and Savannah Grill (fast-food). Staying in Plantation Bay is quite expensive, however. The cheapest rooms will currently set you back about US$120. And that’s exclusive of service charges and taxes! The most expensive rooms cost about five times more. If you want to learn more about Plantation Bay Resort and Spa, their official website, while not quite pretty, is extremely informative. See their picture gallery and a really eye-catching resort map. Plantation Bay’s website is just as realistic as you see it. people are friendly, ambience is more relaxed than other high rised resorts wearing jackets. i felt closer to nature in this place. best in philippines considering other southeast asian resorts including Bali and Phuket. @Cassy, thanks for that info. You really think Plantation Bay is the best? I tend to think that after some sufficiently high level of service, all the nice resorts just make you feel really pleased so I don’t think it makes sense to say which ones are the best ones to visit or not. After all, each one has its own touches that make them unique and good and all. I considered staying at Plantation Bay this May. I made a few inquiries with the resort and, true enough, they don’t come cheap. And they charge you in dollars, which, after conversion, is enough to make you sit upright. Anyway, a few comments I came across made mention of the fact that the food is way, way, overpriced. Any feedback?